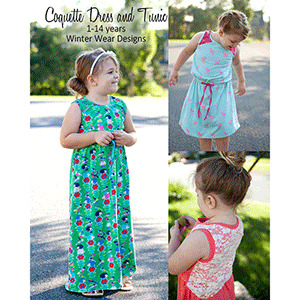 The Coquette Tunic, Dress, and Maxi is the perfect dress to take your child from play to school to dressier occasions. With different accents, fabric selections, and embellishments; the simple lines of the design lend themselves to any look you can imagine. 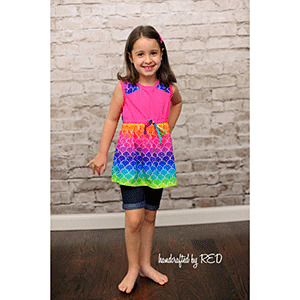 The pattern includes 2 bodice lengths: Short and Blousy. The short bodice hits at the bottom of the chest for an empire length, while the blousy top pools at the natural waist. 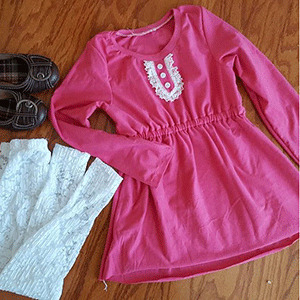 You then have three lengths: tunic, knee length, and maxi. The contrasting strap and double layer back are great places to add lace, sheer fabrics, or pops of color. Pair with leggings and a cardigan - or the Phresh Blazer - for a great transitional outfit into fall and spring. This pattern is available in sizes 1 to 14. 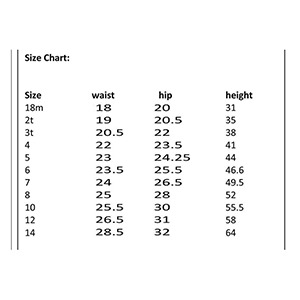 Suggested fabrics are cotton jersey, cotton lycra, lycra spandex, or stretch lace.